In a high-scoring and exciting showdown, Real Madrid stayed undefeated in the 2013-14 Turkish Airlines Euroleague and improved to 3-0 in Group F by downing Bayern Munich 111-87 at home on Wednesday. 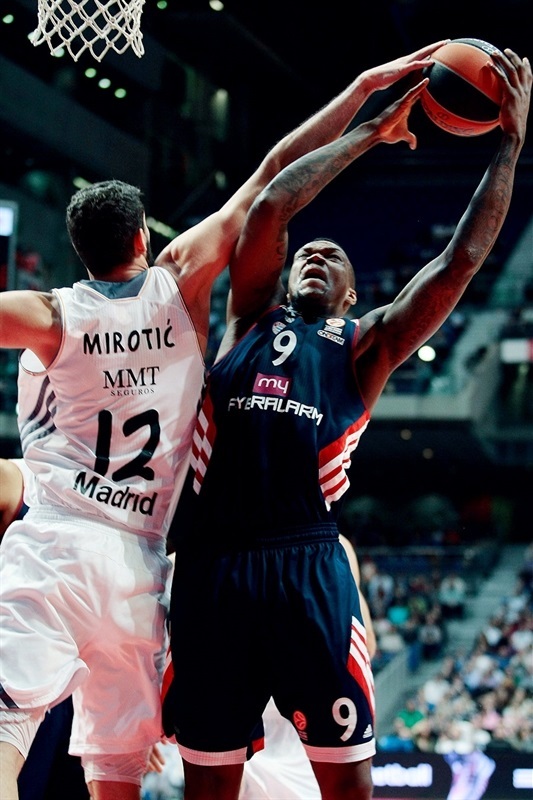 Madrid was the first Euroleague team to break the 110-point mark in over six years. Los Blancos had 41 third-quarter points, two shy of the all-time Euroleague record, which belongs to Maccabi Tel Aviv from the 2009-10 season. 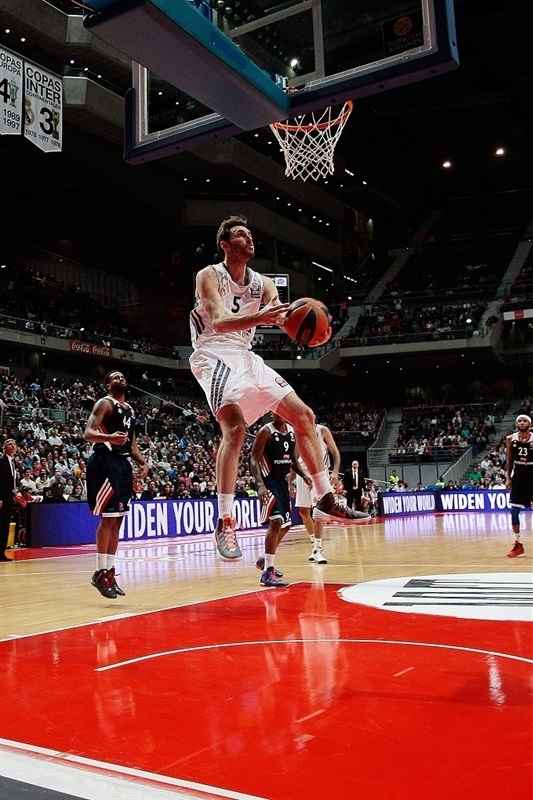 Rudy Fernandez paced the winners with 24 points on 4-of-6 three-point shooting. He paced six Madrid scorers in double digits. Sergio Rodriguez added 19 and 7 assists, Nikola Mirotic had 16 points, Sergio Llull got 13, Jaycee Carroll contributed 12 and Felipe Reyes scored 11 points and pulled down 6 rebounds in just 15 minutes. 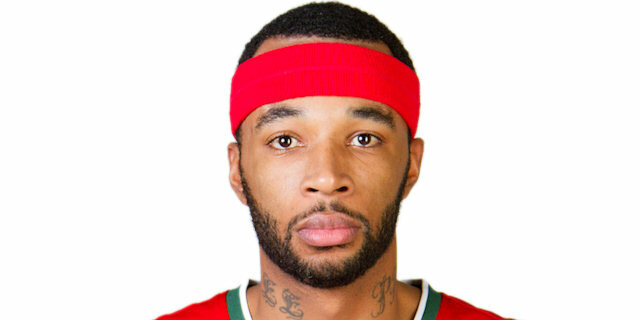 Malcolm Delaney led Bayern with 22 points. Bryce Taylor added 14 while Lucca Staiger and Robin Benzing each had 12 for the guests, who outrebounded Madrid 3-16 in the first quarter to take a 17-24 lead. 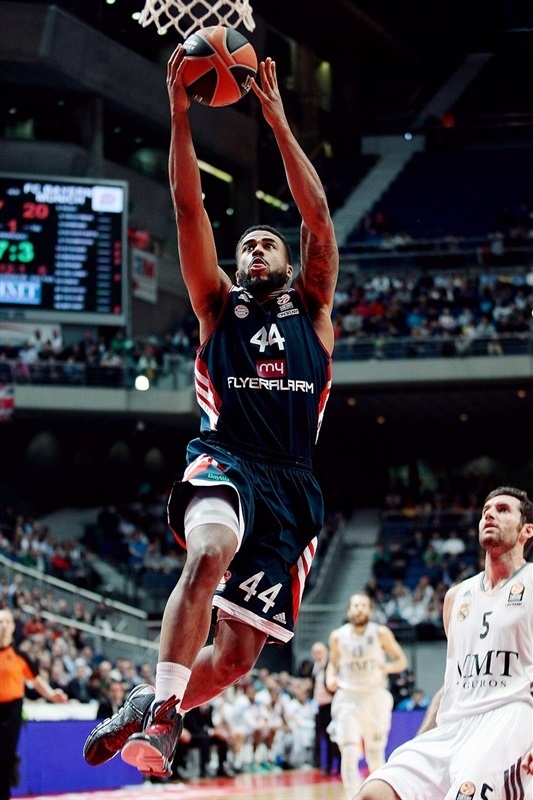 Reyes led Madrid's comeback and a wild buzzer-beating triple by Rodriguez gave the hosts a 48-47 edge at halftime. Madrid, led by an outstanding Fernandez, took off after the break for an 89-68 margin after 30 minutes and control the game until the final buzzer. Rudy got Madrid going with a driving layup. John Bryant beat the shot clock with a turnaround jumper and Staiger bettered Tremmell Darden's mid-range shot with a three-pointer that gave Bayern its first lead, 4-5. Bryant downed a five-meter jumper that Ioannis Bourousis erased with an up-and-under layup. A three-pointer by Mirotic restored a 9-7 Madrid lead. Bayern kept powering the offensive boards and a three-pointer by Staiger gave the guests a 9-10 edge. Benzing joined the three-point shootout to force Madrid to call timeout at 9-13. Delaney provided a highlight with a wild three-point play. Darden and Deon Thompson traded jumpers before free throws by Fernandez kept Madrid within 13-18. Rudy kept pacing Madrid with a big basket. Benzing nailed a step-back jumper and Rodriguez found his first points for a 17-20 score. Taylor scored off a steal and Thompson added a put-back layup for a 17-24 Bayern lead after 10 minutes. 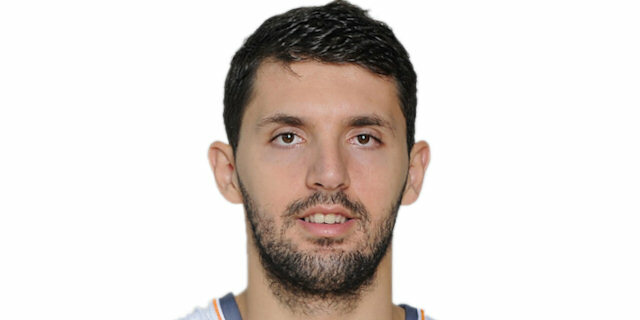 Mirotic struck from downtown early in the second quarter, as Madrid started to lock the defensive boards. Fernandez also sank a three-pointer to bring the hosts within 23-24. Thompson scored in the low post and a jumper by Delaney gave Bayern fresh air, 23-28. Rodriguez hit a one-handed floater in the lane and a fadeaway jumper by Jaycee Carroll caused the guests to call timeout at 27-28. Carroll struck again from downtown to complete Madrid's comeback, 30-28. Rodriguez scored off a steal to cap a 9-0 run, but back-to-back triples by Staiger and Taylor put Bayern back ahead, 32-34. Felipe Reyes hit a mid-range shot and matched Bryant's three-pointer with a layup-plus-foul. Delaney and Reyes traded free throws and a three-pointer by Staiger gave Bayern a 39-42 edge. 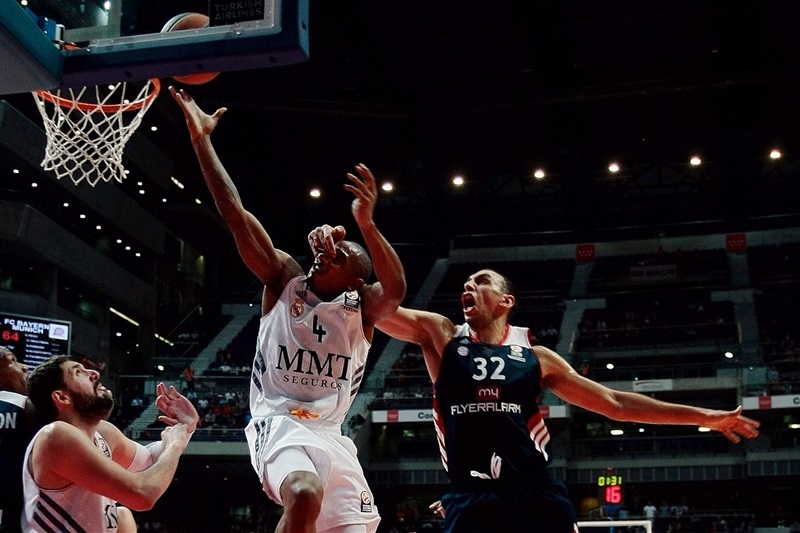 Marcus Slaughter hit a jumper and Rodriguez restored a 43-42 Madrid edge. Benzing nailed a wild three-pointer and exchanged free throws with Reyes before a three-pointer by Rodriguez allowed Madrid to get a 48-47 edge at halftime. 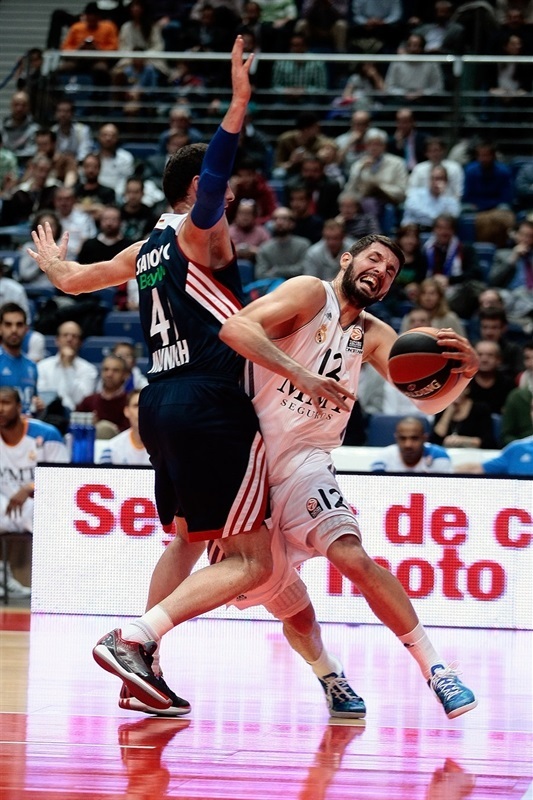 Fernandez downed a triple from the top of the key, which Bourousis followed with a three-point play for a 54-47 Madrid margin right after the break. Delaney stepped up with a wild three-pointer, but Mirotic scored around the basket and back-to-back triples by Llull and Fernandez caused Bayern to call timeout at 62-50. Delaney insisted with another triple. 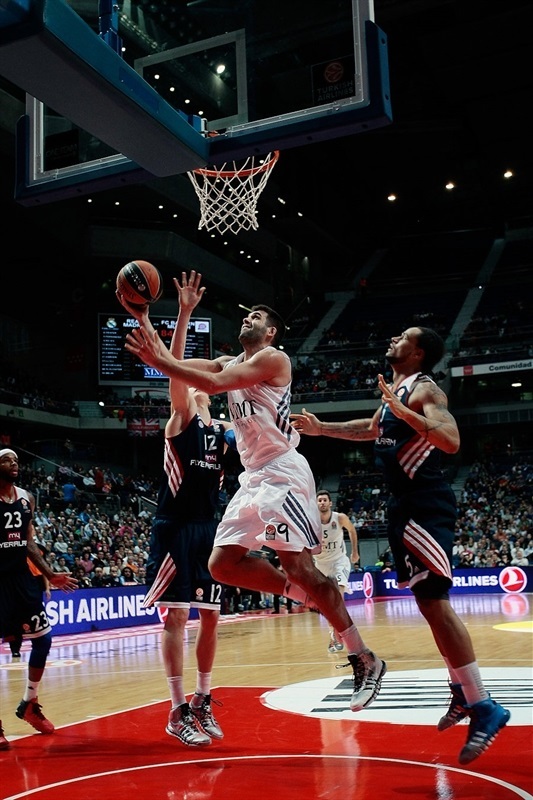 Rudy hit an off-balance jumper and a fast break layup by Llull gave Madrid a 66-53 margin. Benzing hit an acrobatic shot that Mirotic bettered with a three-pointer. Bourousis and a red-hot Rudy made free throws to break the game open, 73-55. Thompson and Taylor tried to change things for Alba, but Fernandez scored again. Taylor and Delaney took over with back-to-back triples, which caused Madrid to stop the game at 75-64. 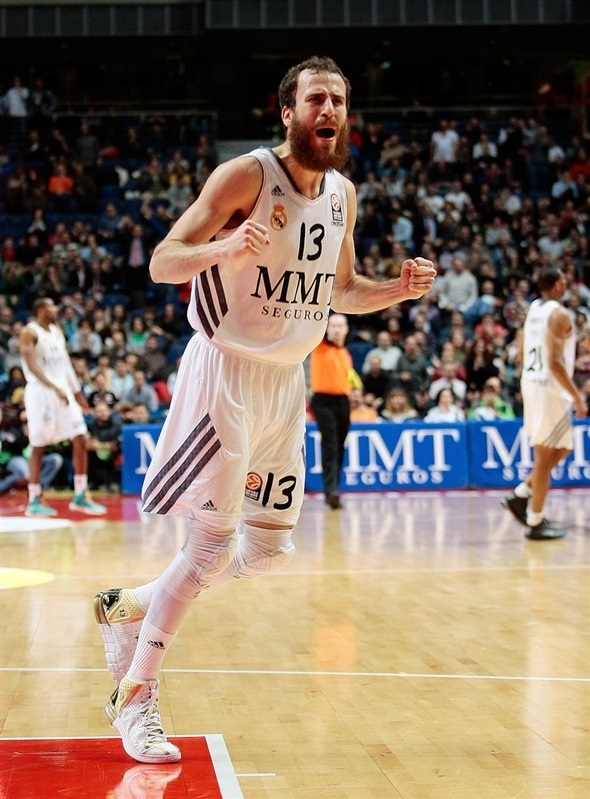 Slaughter hit 3-of-4 foul shots and a three-pointer by Llull boosted the hosts' lead to 81-64. 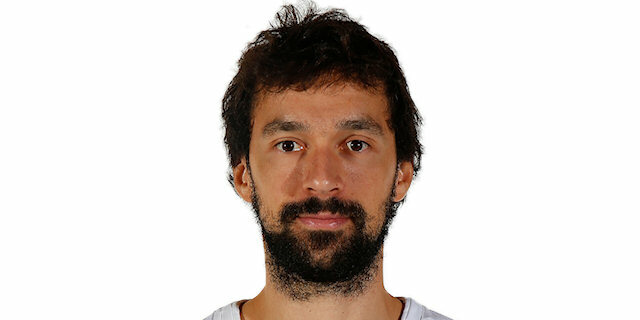 Mirotic followed a technical free throw with a jumper and Llull scored again to make it a 20-point game. Llull beat the shot clock with a wild triple. Heiko Schaffartzik and Taylor kept Bayern within 89-68 through three quarters. Schaffartzik nailed a three-pointer early in the fourth quarter and soon added a jumper to bring Bayern a bit closer, 89-73. Mirotic ignited the crowd with a fast break slam and free throws by Rodriguez kept Madrid way ahead. Madrid had started to use longer possessions to run the game clock down. Delaney hit another triple, but Carroll singlehandedly restored a 96-76 Madrid lead. Savovic dunked only to see Rodriguez follow free throws with a fast break layup that gave Madrid a 100-78 margin with over four minutes left. Savovic scored around the basket. Carroll shined with a driving layup. A jumper by Thompson kept Bayern within 102-82. Carroll hit a baseline jumper and free throws by Reyes boosted the hosts' lead to 106-82. By the time Rudy dove for a steal and immediately hit a wild three-pointer, everything was said and done. Madrid remained undefeated and pleased its fans with yet another amazing home win. "It was a tough game, which is what we expected. It was not a surprise - Bayern deserves to be in the Top 16 and showed it tonight. They had high percentages in the first half and we needed to improve our defense. We dominated the boards in the second half and managed to improve. I am happy with our defense, despite allowing 87 points. Sometimes I am not happy when we allow 60 - defense is more about vibrations than numbers. I want to congratulate my players, I am very happy with this win and the 3-0 start. We can now start thinking about a difficult road game against CSKA Moscow." "The key was the rebounding difference between the first and the second half. We rebounded well in the first half, but not in the second half and that made the difference. Real Madrid is playing really well, but it is still soon to say how far it can go. I have seen teams score 41 points in a quarter before. It is not usual, it doesn't happen often, but this is basketball and anything can happen." " "I don't think that Bayern is a surprise team; they survived the regular season and arrived here with a 2-0 record. We knew it was a difficult, physical team. We didn't play well in the first quarter, but managed to control the boards after the break, run and play the game we like to play. We scored 111 points, which is very difficult to do and are very happy. We are enjoying a lot and appreciate having so many fans supporting us. We hope to carry on playing like that. This is a hungry team that never gets tired and always wants more, not only in games, but in practice. This is not our maximum level, but we have to go step by step." "
"We are very happy. It was a complicated game, especially at the beginning until we improved our defense. We had a good game on offense, scoring more than 100 points. 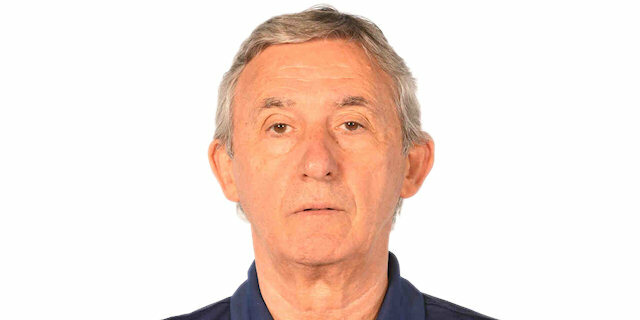 Bayern is the best rebounding team in the Euroleague and have a great coach in Svetislav Pesic and great shooters, too. We didn't play good defense in the first half, Bayern dominated the boards. We knew they could do it, but we managed to fix it. We played at their rhythm early, but improved our defense in the third quarter with Marcus Slaughter and Dontaye Draper on court. We controlled the boards, played better defense and managed to run the break. We played well, but can always get better." "We played well in general, especially in the first half. The game was broken when we were not able to keep up with our three-point accuracy and Madrid started to hit all kind of shots. It is not impossible to beat Real Madrid. Nothing is impossible in basketball."